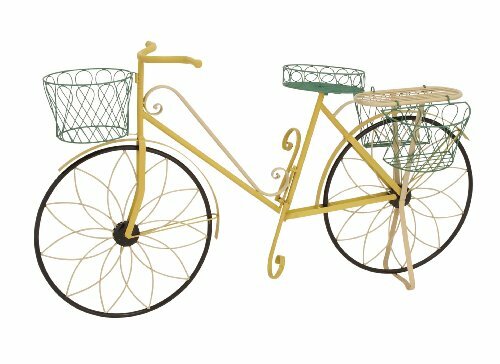 Features Metal bicycle plant stand dimensions: 54 inches (W) x 18 inches (D) x 32 inches (H) Bicycle plant stand color: Yellow, Green, Black Made from: Metal Description: 'Wow! This is amazing!' Well, with similar words or a similar sounding line you will express your surprise at this metal bicycle plant stand. If you want to ingeniously create space for keeping you plants in then what you must get is this plant stand. Perfect for your shed or veranda, or even the living room-this bicycle stand can accommodate on its various planters. For example, it has baskets all around it; in them you can keep all sorts of plants. Additionally, this bicycle stand has been made with quality materials; this means that it won't rust and hence will last with you for years to come. Guests who see it will certainly be pleasantly surprised. Children will especially like it. Indeed, this plant stand is an ingenious creation. Certainly a must have for those who loves planters. Dimensions: 28.5l" X 28.5h" X 28.5w"
If you have any questions about this product by Benzara, contact us by completing and submitting the form below. If you are looking for a specif part number, please include it with your message.